Has there been a huge growth in the number of judicial reviews? In a speech at the Confederation of British Industries (CBI) today, David Cameron announced a clamp down on the use of judicial reviews, a type of legal action which enables individuals to ask a judge to consider the legality of action taken by public bodies, including the government. According to the Prime Minister the practice has now become rampant, and government cannot keep up with current levels which stop it from proceeding with policies to help boost the economy. The sentiment was echoed by a Ministry of Justice press release on the same day. Chris Grayling shared the concern over "the burdens that ill-conceived cases are placing on stretched public services as well as the unnecessary costs and lengthy delays which are stifling innovation and economic growth." The numbers indeed appear to be staggering. Reporting on the story, the Telegraph quoted the Ministry of Justice: "the number of applications for judicial review rose from 160 in 1975 to 11,200 last year." Indeed in 1974 - rather than 1975 - there were 160 applications for judicial review in England and Wales, as reported in a 2006 House of Commons research paper on Judicial Reviews. Neither the PM's speech nor the Ministry of Justice press release explain what is behind this incredible rise. The UK Human Rights Blog proffered that the rise could be traced in the growth of the state or the decrease in trust of politicians. To answer this question, we first ventured to find out what the source for these figures was. In 2011 the Ministry of Justice released its annual Judicial and Court statistics report which presented those same figures: 11,200 applications for permission were received. But the table below, from the report, presents an interesting caveat. 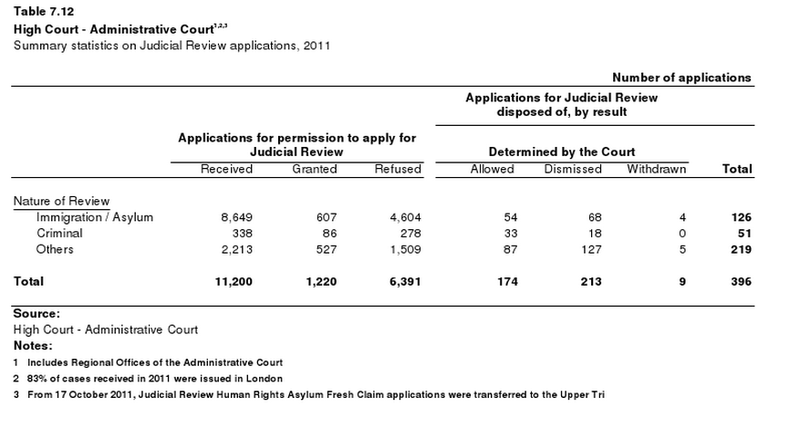 This MoJ table divides the judicial review applications into three categories: immigration/asylum; criminal; and, "other". It is clear from here that the significant increase was driven by immigration and asylum cases, which at 8,649 make up three fourths of all applications from 2011. By looking at past data - beginning from 2004 - it becomes clear that if we don't take immigration and asylum cases into consideration, there has been no explosion of judicial review cases, but rather a very modest increase. In the past 10 years, the total figures for "other" have ranged between a low of 1,685 applications in 2004 to a high of 2,228 in 2006. Figures from 2011 are slightly lower, with 2,213 non-immigration and non-crime JR application. What is interesting is that the Telegraph refers to this as an "assault on planning laws," though neither the text of Mr. Cameron's speech nor the MoJ press release make a specific reference to planning rulings. Applications related to planning - stocked in the "other" category - constitute only a minority of all applications. Indeed, MoJ figures from 2006 show that out of 10,657 total applications, only 140 related to town and country planning. "There were 18,811 applications for permission to apply for judicial review in the Administrative Court, a 12 per cent increase on 2010. Of these, 11,200 were received, 6,391 applications were refused and 1,220 were granted." We're not entirely clear what happens to the thousands of applications that are sent but not received, and we will investigate this further. Unhelpfully the Ministry of Justice statistics do not contain definition of the different categories used. From the table above, we gather that out of all permission applications submitted in 2011, roughly 6% had permission "granted," i.e. were accepted for review. Out of the 396 substantive judicial reviews that were dealt with in 2011, having passed the first hurdle of getting permission, 173 (44%) were allowed. The government gave two numbers to justify the needs it sees for reform of judicial review. The first was that the number of JRs has increased dramatically. This is correct, however it is largely because of immigration and asylum claims and does not necessarily reflect on the judicial review procedure in general. Secondly, the government is correct to say that there is fairly high rate of refusal of JRs across all topics. It will presumably be a matter for debate whether this is a good reason to restrict its availability. Legal aid: how many barristers are earning six figure sums at the public's expense?